The Stark AR Rifle Grip grip has no integral trigger guard, which allows for installation on any AR rifle, including billet receivers. Shooters who prefer to retain the original trigger guard on their rifle will appreciate this easier to install, lower price grip. As with our STARKONE AR grip the angle of the grip is more natural for your hands (closer to a 90-degree angle), allowing the shooter's arms to stay tighter to the body with the wrist straighter. The stop located at the upper back strap locks the hand in place with the index finger at the same angle to the trigger every time. The grip has a secure storage space for various sized batteries and a durable, textured material. The Stark AR Rifle Grip is designed to maximize weapon control, reduce shooting fatigue and support a solid tactical platform. Each crucial point of shooter-to-weapon contact has been carefully thought out, tested by professionals, and optimized to benefit the user in every type of situation. The rugged, textured material provides a reliable grip when it counts. Novice and veterans alike will appreciate its unique design, no matter the environment or mission. 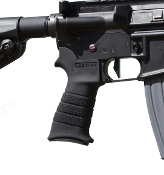 Add an optional Single Point Sling Mount The Stark AR Rifle Grip With optional Sling Mount is the first and only AR-15 pistol grip to integrate an ambidextrous sling mount. The Sling Mount is available in two versions: The Hook Mount provides a loop for attaching most common sling hooks and the Swivel Mount allows the attachment of push button detachable sling swivels. The Sling mount is positioned above the hand and below the stock, out of the way of fully collapsed stocks. Povides excellent one-handed control when added to AR pistols. Extensive strength testing has been performed on the Stark AR Rifle Grip With Sling mount to ensure a reliable attachment point that you can depend on.